Courtyard Birmingham Hoover is located south of Birmingham, just off Highway I-65 in Hoover just 11 miles south of Birmingham's city center. Nearby attractions include Riverchase Galleria Mall, Birmingham Jefferson Civic Center, Birmingham Zoo, Hoover Met Stadium, Legion Field, Robert Trent Jones Golf Course, Oak Mountain State Park, Alabama Adventure and more. The hotel has 4 floors featuring 140 spacious guest rooms and 13 suites with amenities such as Air conditioning, Iron and ironing board, Luxury bedding - crisp linens, thicker mattresses, custom comforters, fluffier pillows, Microwave oven, Movies/videos, Hair dryer and voice mail. 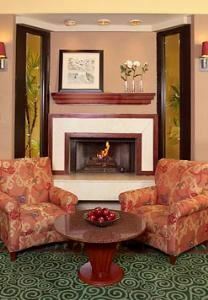 The hotel offers Complimentary on-site parking, Wet bar, Courtyard Café, Outdoor Pool, Whirlpool, Fitness Center and smoke free policy. The hotel also offers meeting and banquet facilities with a total of 1278 square feet of event space with amenities like AV equipment, Printers, copy and fax services, wired and wireless internet access.